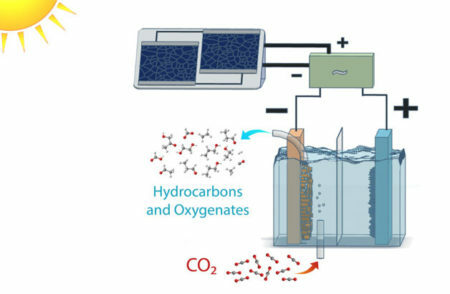 Lawrence Berkeley National Laboratory (LBNL) scientists have harnessed the power of photosynthesis to convert carbon dioxide into fuels and alcohols at efficiencies far greater than plants. The achievement marks a significant advance in the effort to move toward sustainable sources of fuel. Schematic of a solar-powered electrolysis cell which converts carbon dioxide into hydrocarbon and oxygenate products with an efficiency far higher than natural photosynthesis. Power-matching electronics allow the system to operate over a range of sun conditions. Image Credit: Clarissa Towle/Berkeley Lab. Click image for the largest view. Many systems have successfully reduced carbon dioxide to chemical and fuel precursors, such as carbon monoxide or a mix of carbon monoxide and hydrogen known as syngas. This new work, described in a study published in the journal Energy and Environmental Science, is the first to successfully demonstrate the approach of going from carbon dioxide directly to target products, namely ethanol and ethylene, at energy conversion efficiencies rivaling natural counterparts. The LBNL researchers did this by optimizing each component of a photovoltaic-electrochemical system to reduce voltage loss, and creating new materials when existing ones did not suffice. Another research group at LBNL is tackling this challenge by focusing on a specific component in a photovoltaic-electrochemical system. In a study published today, they describe a new catalyst that can achieve carbon dioxide to multicarbon conversion using record-low inputs of energy. The researchers characterized the materials at the National Center for Electron Microscopy at the Molecular Foundry, a DOE Office of Science User Facility at LBNL. The results helped them understand how the metals functioned in the bimetallic cathode. Specifically, they learned that silver aids in the reduction of carbon dioxide to carbon monoxide, while the copper picks up from there to reduce carbon monoxide further to hydrocarbons and alcohols. Its a big step forward indeed. Costing out fuel molecule builds by the energy inputs has so far defeated any competitiveness with fossil fuels. But those days could be numbered. Someday oil and natural gas prices will go up, the economic shock will be severe and these kinds of technologies need to be project ready by then. Maybe this is a good sharing. And the Solar Powers can help us do a lot of things. Solar power contains a lot of energy, and with the development of society, it becomes more and more important. Good sharing! I have learnt a lot! Its a big step forward indeed. It’s really something. It means great progress has been made in human science and technology. Everyone should pay attention to such topics. Great innovation! solar power is clean, people should try to use it efficiently. It is a quite informative post! solar is a powerful energy, and the most point is the limitless, so that if we use in appropriate, this kind of energy can create higher value for us. Solar energy should be used efficiently by human.